Born (17 April 1870) at 45 High Street, Musselburgh, Inveresk at his gradfather’s house, son of a famous club and ball maker of the same name who lived in Shrub Lane, Edinburgh with his wife Hannah Hood. The golfing tenticles on the Hood family would extend to Ireland, New Zealand, Japan and North America. In his early twenties he would become Royal Worlington and Newmarkets first “professional/steward/greekeeper, with his duties doubtless including those of clubmaker and caddiemaster”, as detailed in Gillum’s research into the history of the club, and suggests Hood wasn’t the course architect but did play a major part in its layout being the person supervising its contruction. By 1910 Hood was claiming in his advertisement (see below) that he had twenty years experience in course design. The fact that the title of best nine-hole golf in the world is attributed to the course is testament to its stature and longevity. However Hood’s tenure was short and was replaced by Jack White (the 1904 Open Champion). Afterwards Hood took up a position at Raynes Park before joining Royal Dublin in 1899. The census of 1911 suggests he may have in fact been born in 1870/1 and was married to Sarah Agnes Phillips, daughter of the landlord at the Bell in Worlington, for eighteen years (1893) and had five children; Karen Mary (16), Thomas Charles (14), Fred Brian (12), Edith Mary (9) and Doris Lilian (6) and resided at 12 Conquer Hill, Clontarf East, Dublin. However Thoms Directory suggests he lived at 2 Conquer Hill, “Unavara”, prior to this, from the bottom of this hill you can view the Royal Dublin Golf Club. In the aforementioned census he refers to himself as a Golf Club Manufacturer rather than a professional golfer. Hood joined Royal Dublin in 1899 and continued in the position until 1914 when the British Army commandeered the golf course. Hood travelled in his brother’s Fred footsteps to New Zealand in 1903 and took up a position with Wellington Golf Club on a two year contract but returned to Ireland in 1906 after attending a professional tournament with his brothers in Australia. It is uncertain what the Dollymount club was doing for a professional while he was away in New Zealand but on his return Hood continued on as professional for the club despite Michael Moran taking a position with the club in 1908 as a playing professional. In the previous year’s open professional tournament Hood had finished twenty-three shots behind Moran over two rounds at Royal Portrush. He joined Clontarf for a short period during 1914 but then disappeared from the radar but appears to have returned to England and joined the Militia or National Guard during the Great War. 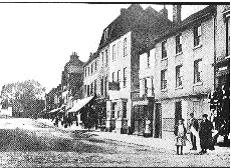 During the war he became a hotel-keeper running the White Hart Hotel at Ely. 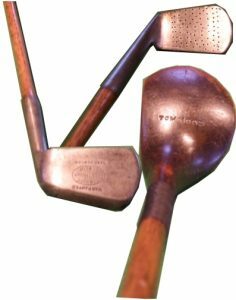 Has a large stock of the very finest clubs of best selected Scotch beech and split hickory shafts, all thoroughly seasoned; also our special Dogwood and Persimmon drivers, 5/6; Brassies 6/- and compressed hickory unbreakable clubs: Drivers 6/6, Brassies 7/-, clubs copied 1/- extra. Try our Special Rocket, Bramble and Dollymount balls 7/6 per dozen. All balls bought or exchanged, any quantity. Hood would also appear, according to the Irish Golfers’ Guide 1910, to have had a business at 10 Trinity Street just off College Green in the city centre presumably to further his retail capacity. Between December 1906 and 1909 he operated from 3 Church Lane, now the extended location of one of Dublin’s landmark pubs; O’Neill’s of Suffolk Street. Also Peter Georgiady suggests there is a record of him having a place at 38 Henry St. Dublin in 1906. While not the greatest golfer in Ireland in the early 1900s, despite qualifying for the last eight in the Irish Professional Championship, his business savvy and ability as a club maker are beyond question. In fact the the captain of the Royal Dublin stated: “he had no superior in the Kingdom”. 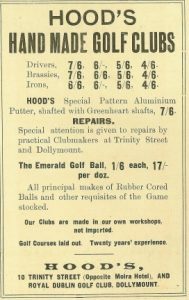 Around 1910 it is suggested he took a legal action against James Braid when Hood had designed a high quality club allowing Braid to use it for demonstration purposes but Hood claimed copies were made and sold which infringed his copyright. What kind of club or what was the ultimate outcome remains a mystery. Tom Hood had a huge impact on Irish golf in a relatively short space of time; apart from being one of the founding members of the Irish Professional Golfers’ Association (June 1911) and taking part in the first Irish Professional Championship he was also involved in the layout of a number of courses including: Castle, Grange, Rathfarnham, Wooden -bridge, Tramore and Wicklow golf clubs. In the Irish Fields Golfers’ Guide in 1909 he wrote an article entitled: Greenkeeping and the Art of Laying out of Courses. After his time at Clontarf he turns up again at Royal Worlington and Newmarket Golf Club where he left in 1923 to run the Old Bridge Hotel in St. Noets.